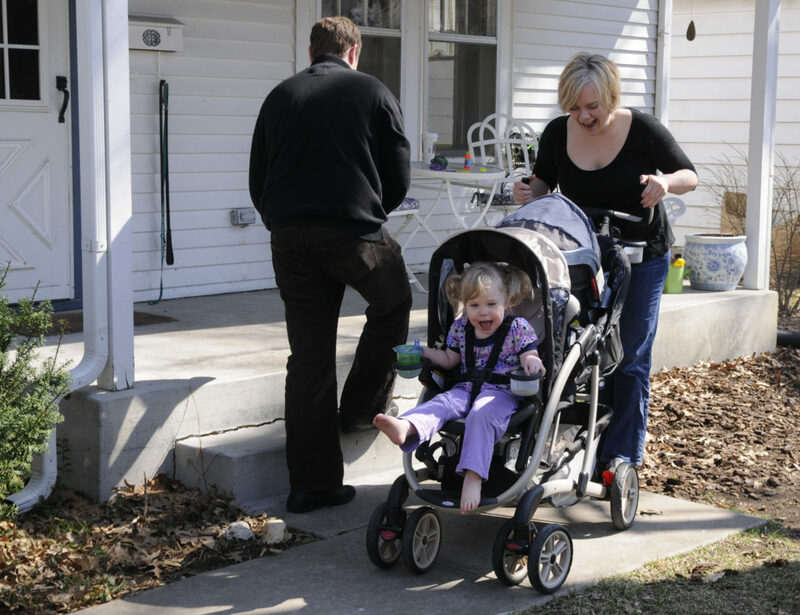 Babel Piepergerdes, 2, delights in the opportunity for a stroller ride, pushed by her mother, Samantha Mee. The family recently purchased a two-seated stroller to include their newest family member, 5-month-old Jasper, seated behind Babel. At left is their father, Brent Piepergerdes. Samantha Mee admits she might have overthought it. She recently purchased a stroller for her two children, 2-year-old Babel Piepergerdes and 4-month-old Jasper Piepergerdes. She chose a Graco Quattro Tour Duo. Juggling a baby or young child while on the go can be stressful at the best of times, but it’s even more of a challenge when your stroller won’t cooperate. The goal: Find the perfect baby stroller to cart your kiddo around town without tearing your hair out. Elizabeth Ross, store manager at The Blue Dandelion, a children’s boutique at 841 Mass., has some answers. As mother of a 4-year old boy (who still fits in strollers), she’s done her homework. One of the “Cadillac models” of stroller in the Blue Dandelion is City Elite by Baby Jogger, retailing for $449. “The cool thing is the one-hand folding up of this stroller, with just a tug of the strap,” Ross says. A big trend right now for moms is jogging with the baby, and the City Elite is an all-purpose stroller. The Blue Dandelion’s most popular stroller is the McClaren Triumph, retailing at $175. Ross also recommends the Travel System-type strollers — strollers that adapt to car seats, so that a mom doesn’t have to jostle a sleeping baby around when taking him out of the car and placing him or her in the stroller. Another popular model at Gary Gribble’s Running Sports, 839 Mass., is the Beast of Burden Revolution, known as the BOB, which retails for $389 for a single and $569 for a dual. Adam Hess, service manager of Sunflower Outdoor & Bike, 804 Mass., also touts the virtues of the BOB.